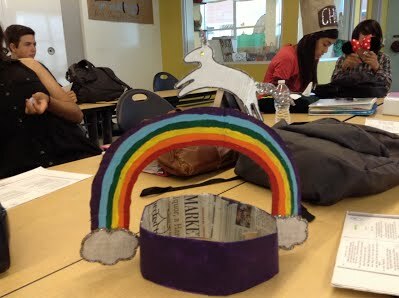 Before we started reading the epic tragedy of Romeo and Juliet, that had me basically sobbing by the end, we got into partnerships to make a hat for each character. 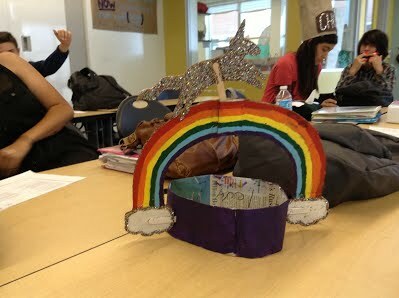 Every day, before we started reading, someone would be assigned a character that they would read for during the play, and they would have to wear that character's hat. The hat had to somehow embody or resemble the the character that it was for. For example, the people that made the character Paris's hat put a cardboard Eiffel Tower on it. My character was Mercutio, kinsmen to the Prince and Romeo's best friend. Some literary critics argue that Mercutio is actually gay, and has feelings for his best friend, Romeo. We based our hat on that piece of inferred information. of areas that I could use improvement are my painting and putting the pieces of the hat together. If you look clearly, you can see that my painting skills need to be improved because the colors overlap each other too much, and on one side, the rainbow pattern is correct, but on the other, it is not. I could improve on how I put the pieces together because the unicorn at the top was too lose too often.